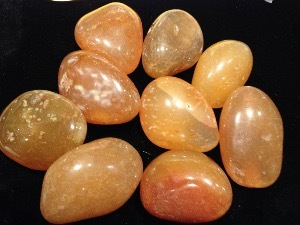 Banded Carnelian Large tumbled to a smooth finish, an ideal pocket size stone, small enough to carry around with you. Tumble Stones can also be placed around the home for their energies or can just be nice decorative items. 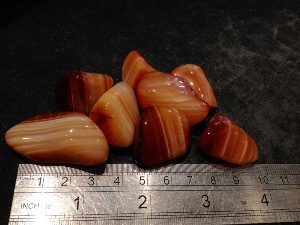 Banded Carnelian crystal gemstone of varying sizes selected specially for your order. Carnelian is a variety of the silica mineral Chalcedony which is a microfine type of Quartz coloured by impurities of iron oxide. The colour can vary greatly ranging from pale orange to reddish-brown. Carnelian is commonly used as a semi-precious gemstone, sold as tumbled stones, polished pebbles and jewellery, sometimes it is available as rough pieces or crafted and polished shapes. During Roman times Carnelian was used to make engraved gems for signet or seal rings for imprinting a seal with wax on correspondence or other important documents as hot wax does not stick to carnelian. Worn next to the skin it enhances the absorption of vitamins and minerals and helps with pain relief from the discomfort of Arthritis, Rheumatism (inflammation and pain in the joints, muscles, or fibrous tissue, especially rheumatoid arthritis.) also Neuralgia (intense, typically intermittent pain along the course of a nerve, especially in the head or face). Also helps with gall stones, kidney stones, pollen allergies and colds, helps with disorders of the spine, spleen and pancreas. as an elixir to help heal cuts and abrasions. At Work - It stimulates ones inventiveness, resourcefulness, capability, imagination, originality, creativity; drive, ambition, motivation, spirit, vitality, leadership and vision. At Home - It invites abundance into ones home, stabilising energies in the environment removing negativities and enhancing a "love of life’ energy, ideal for homes or a retreats. Calming and soothing of anger. Aids hobbies and pursuits such as theatrical dramas.